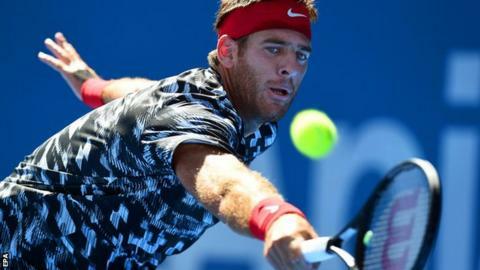 Former US Open champion Juan Martin del Potro's comeback event after a serious wrist injury has ended in quarter-final defeat in the Sydney International. The Argentine, who had been out for 10 months before returning on Tuesday, lost 7-6 (7-5) 7-6 (7-3) to Kazakhstan qualifier Mikhail Kukushkin. Del Potro had been looking to increase his court time before the Australian Open begins in Melbourne on Monday. "It was a tough match," he said. "But I think it's been a great week for me." The former world number four, 26, beat Ukraine's Sergiy Stakhovsky and top seed Fabio Fognini of Italy to set up the tie against world number 66 Kukushkin. "I played three matches in a row and I played against good players, which means a good comeback for me," added Del Potro. "I served well against Kukushkin, but my wrist hurts a little bit more than Wednesday, and I couldn't hit harder than my last match." Two-time Wimbledon champion Petra Kvitova continued her Melbourne preparations by reaching the women's final with a 7-5 6-1 victory over Bulgarian Tsvetana Pironkova. Kvitova, seeded fourth for the Australian Open, will face Karolina Pliskova in an all-Czech encounter on Friday. Pliskova secured her place by beating Germany's world number nine Angelique Kerber, who lost 6-3 6-2 after progressing to the last four by winning a series of three-set marathons. Australian Casey Dellacqua's build-up to her home Grand Slam was ended when the top seed lost 7-5 2-6 6-3 to Italy's Karin Knapp in the second round of the Hobart International.